We've got the operating system, we've got the hardware, and now we've got the human interface device. The third prong of Valve's all-out attack on living room gaming is the Steam Controller, a hackable gamepad with dual trackpads, haptic feedback and a touch screen. Two clickable trackpads are the most prominent feature of the Steam Controller. a pair of touch-sensitive pads with resolution approaching that of a desktop mouse. It's the logical halfway point between mouse and gamepad control. Adding physicality to an otherwise light-touch experience, Valve has outfitted the Steam Controller with advanced haptic feedback, delivering in-game information about "speed, boundaries, threshholds, textures, action confirmations" and more to players' fingertips via highest-bandwidth haptic information channel of any consumer product on the market. The Steam Controller's central screen might seem like a Wii U me-too, but Valve promises an interesting feature that would resolve one of the challenges of playing games that display graphics on a TV while also showing things on a controller screen. When a player touches the screen on the Valve controller, whatever is on that screen will be overlaid on top of whatever is being shown on their TV, " allowing the player to leave their attention squarely on the action, where it belongs," the company said. The controller will have a legacy mode built-in, allowing it to be configured as a keyboard and mouse. A configuration tool will be made available so the Steam community can create and share their own configurations. For much of Steam's existence, Microsoft's Xbox 360 controller has proven to be the popular controller for PC gamers who wanted something other than mouse-and-keyboard. The new Steam controller moves many of the buttons of the the 360 controller, drops the d-pad altogether, and trades in sticks for the two big circular trackpads. It's main fealty to the 360 form factor is in its overall shape and the position of its shoulder and trigger buttons. Valve themselves knocked traditional controllers in today's announcement, stating that "Traditional gamepads force us to accept compromises. We’ve made it a goal to improve upon the resolution and fidelity of input that’s possible with those devices. The Steam controller offers a new and, we believe, vastly superior control scheme." The 360 controller will continue to work with PC games, of course, and we'd be surprised if it can't work with a Steam Machine. Meanwhile, Microsoft is prepping the release of its own new controller, the subtly upgraded Xbox One controller that is basically intended to be an improved 360 model. That controller won't work with PC games until 2014, according to Microsoft. 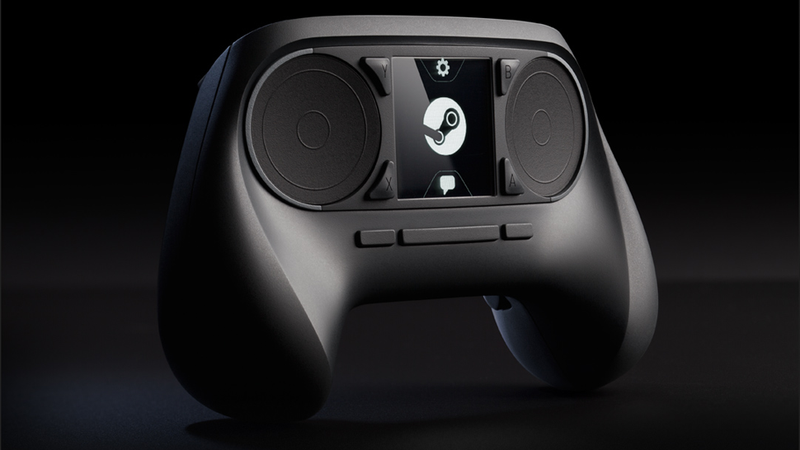 The Steam Controller will be made available first to lucky Steam users who get into the Steam Machines beta test. Steam, Steam, Steam. You have questions? Valve has answers. I’m a developer - how can I include support for the Steam Controller in my game? This is the third and final of three announcements scheduled this week in order to show the world what Valve's new hardware initiative is all about. On Monday, Valve unveiled SteamOS, a Linux-based operating system designed for living room gaming. On Tuesday, the company talked Steam Machines, formerly-known as Steam Boxes, living room systems from multiple manufacturers utilizing SteamOS, due out in 2014. Together with the latest announcement, Valve is effectively breaking down the few remaining obstacles standing in the way of PC gaming dominance in the living room. 2014 is going to be one hell of a year in gaming. Can Valve create the perfect game machine and win against MS and Sony?